Modern fitted wardrobe - what are the options? Modern fitted wardrobes – what are the options? You probably can’t imagine a modern home without a wardrobe. Sliding door wardrobes are getting more and more popular. It is one of the modern types of closets that easily can fit in almost any space. If you have limited space and you want to convert it into something beautiful and useful, then you should consider fitted wardrobes. Through wonderful mirror wardrobes, one can change the look of their simple or dark room into a modern fascinating space. 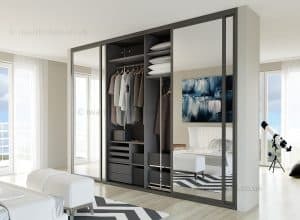 Mirror wardrobes actually help a lot in letting you go without additional mirror. Therefore, this product provides two-way functions. At Iwardrobes we provide sliding and hinged fitted mirror wardrobes. There also is a wide choice of mirror effects and colours so you can add an accent to your storage unit. When you decide to go for a bespoke wardrobe with Iwardrobes it really is up to you to decide the design of you future closet. With sliding door storage there is a great choice of options – frameless sliding door wardrobe, mirror sliding wardrobe, spray-painted sliding door closet etc. This type of wardrobe has the ability to provide you with creative functional storage for all your clothes, belongings and accessories. Why are modern fitted wardrobes so popular?